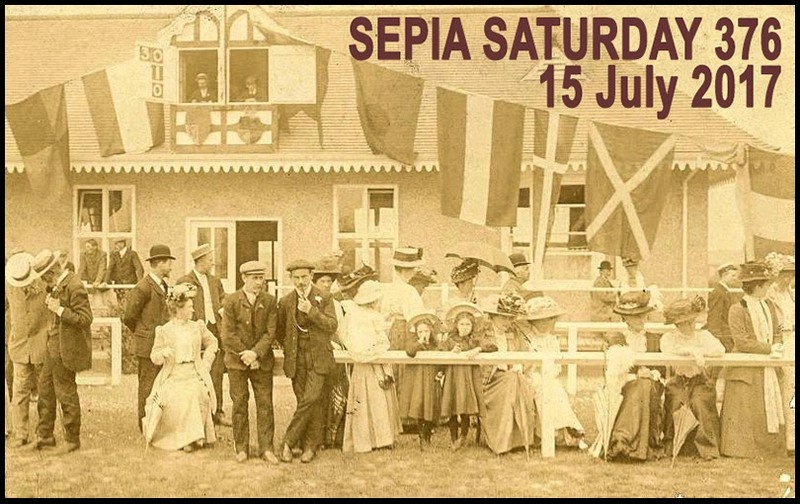 It may be a little late in the day, but perhaps we should put the flags out to celebrate the fact that I have managed a Sepia Saturday post at all, after a week of carpet fitters, carpet cleaners, floor installers, dishwasher repairers and dog groomers. 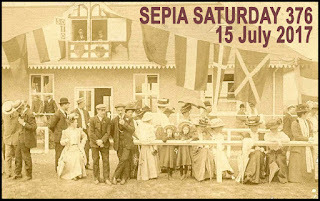 And hanging the flags out would be a most suitable response to our Sepia Saturday prompt image for this week (OK, last week) which featured the celebratory flags being flown to mark the opening of a new sports pavilion. 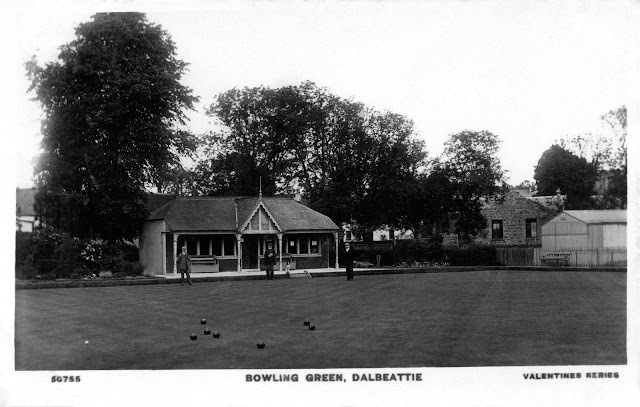 I think I have managed to get a good match with this early twentieth century real photographic postcard of the pavilion and bowling green at Dalbeattie. 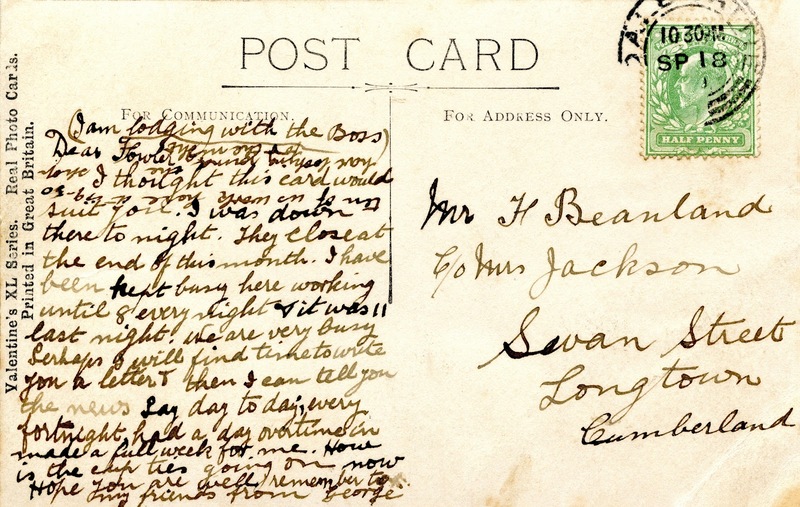 the card was part of the collection passed down to me by my great uncle Fowler Beanland. 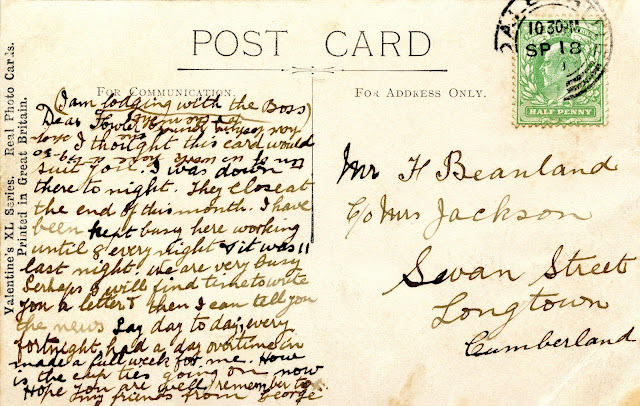 It was sent to him at his address in Swan Street, Longtown in Cumberland and therefore must date from the early years of the first decade of the century when he was living and working there. 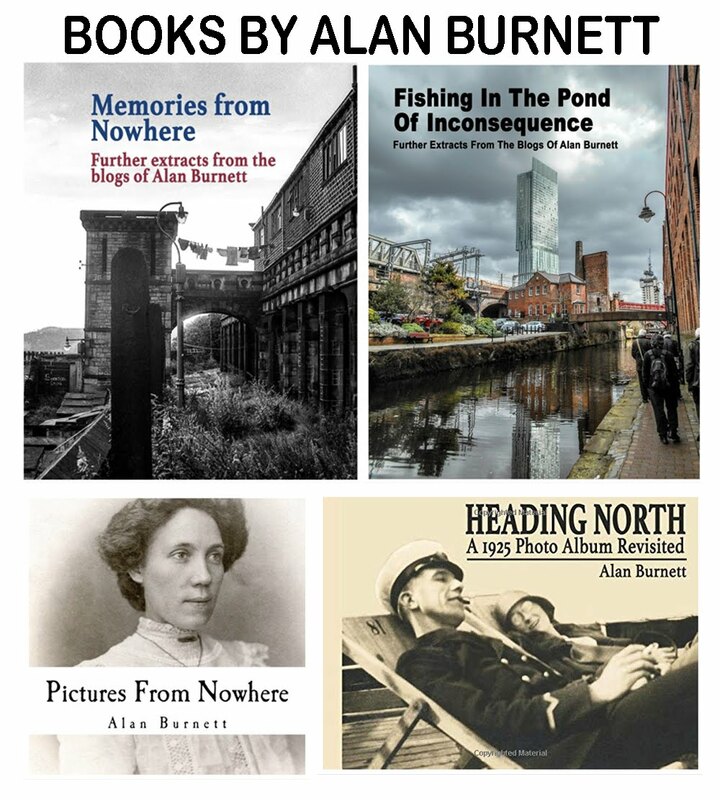 He had moved there in 1904 from his home town of Keighley following the small textile machine manufacturing business he owned with his father and his brothers going into receivership. At the time he would have been 32 years old. I thought this card would suit you, I was down there tonight. They close at the end of this month. I have been kept busy here working until 8 every night and it was 11 last night. We are very busy. Perhaps I will find time to write you a letter and then I can tell you the news, say day to day every fortnight - had a day overtime and it made a full week for me. How is the clip ties going on now. Hope you are well, remember to my friends. "ten of us work here. it is 9.50. love looking around the shop for the nights"
Whatever that means I have no idea at all, but it is fun to speculate. Whatever the answer may be, it does illustrate the rather strange upside down life of Fowlers' friend George. Glad I had a direct link when you posted, since this wasn't up on the SS list when I looked to catch up on posts this morning. Hey, aren't you the guy? Well anyway, I am also stymied by the meaning of the upside down message. Bowling is an elegant 2-dimensional game, so unlike most ball games which involve another axis of motion. Here even the dog seems to be carefully considering the calculations for the next bowler. When I view blogs, I go for the visuals first and then read. Wow, bowling green came to mind but I though boce ball.